Materials such as tin are increasingly assessed by consumers, investors and legislators on the three aspects of sustainability – economic growth, contribution to society, and protection of the environment. Recognising the importance of these factors, the tin industry has initiated a long-term action plan which aims to demonstrate the positive contributions and sustainability of tin. 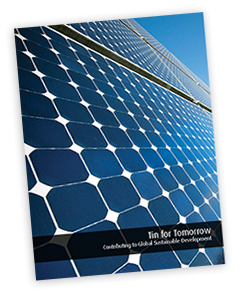 This report provides an introduction to the role of tin in the global economy, describing its history, usage, production and future potential. It also provides descriptions of a series of projects in which the tin industry supports improvements in environmental health, reductions in energy consumption and economic development in some of the poorest countries. and other infrastructure. Leading mines and smelters are committed to corporate and social responsibility programmes and post-mining land rehabilitation. Recycling is also playing a growing role, with more than 30% of tin use now accounted for by secondary refined tin and alloys. Products containing tin contribute to quality of life, with a number of existing and new applications connected to health and energy-saving benefits.